Nursing faculty sought to promote students' engagement with course material and their peers by using Kaizen, an online educational game. The purpose of this qualitative study was to learn more about nursing students' perceptions of team competition in an educational game and whether the game promoted their engagement with educational material in one fundamental nursing course. Qualitative data collection included focus groups, observations of students, documents showing leaderboards and game participation, and “status of competition” e-mails. Data were transcribed and coded to determine emerging themes. Four themes emerged from data analysis: learning in teams, motivators to play, learning course content, and suggestions for game improvement. To maximize student engagement, educators are integrating gamification techniques that use game design with computers and mobile devices. In 2012, faculty and staff at the The University of Alabama at Birmingham (UAB) School of Medicine developed a game named Kaizen-Education to allow medical residents to apply and enhance their health care knowledge outside the clinical environment. The name “Kaizen,” a Japanese word referring to continuous improvement, was chosen by the developers to reflect the purpose of the game. Faculty wanted to create a fun learning experience that would engage students outside the hospital walls after new duty hour standards reduced the number of weekly hours residents could remain in the hospital. In 2014, the School of Medicine faculty shared the Kaizen software with faculty at the UAB School of Nursing, who began to use Kaizen in graduate-level courses as a way to engage students in distance-accessible programs. The students' enthusiastic responses influenced other faculty to include Kaizen competitions as part of clinical courses in the undergraduate nursing program. Faculty viewed the game as an innovative way to deliver practice questions for course and licensure examinations. Although faculty had considered using other third-party online game applications, they preferred the customizable features of Kaizen-Education (henceforth Kaizen) that allowed them to develop their own discipline-specific badges and messages. Faculty also wanted access to the shared question bank containing every question written in Kaizen games and all artwork previously used for badges, a feature that allows faculty across professions to exchange and adapt educational content in a collaborative manner. Faculty developed their own multiple-choice questions based on content that was covered in class the previous week and also adapted some questions from the shared question bank. 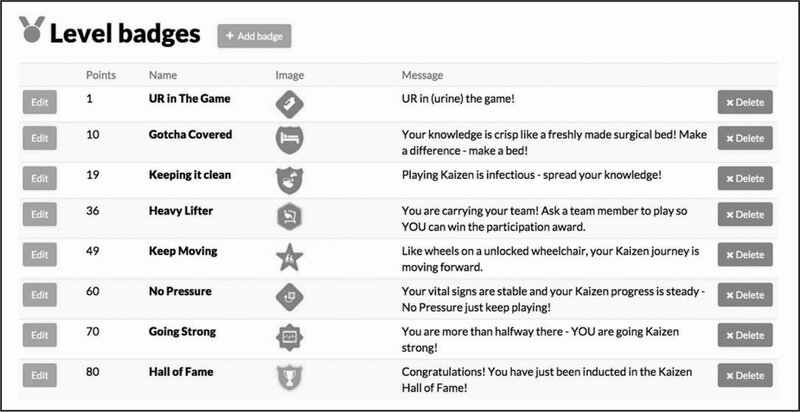 The Kaizen game software delivers multiple choice questions in a game format, generating individual and team competitions, with results displayed in real-time status via a leaderboard. Instructors have the option of embedding videos as part of the question content. 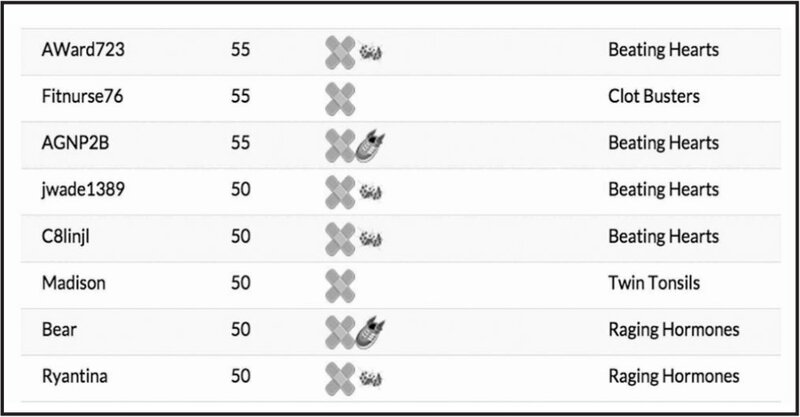 Students receive immediate feedback after answering a question, including a rationale for the correct answer; they also occasionally receive creative badges for longitudinal participation (marathon badges), consecutive correct answers (hot streak badges), and points earned (level badges) (Figure 1). Players can see individual and team scores on a leaderboard (Figure 2), but they also can create their own anonymous user names after instructors add them to the game roster. Students and faculty are allowed to send each other messages within the game, such as encouraging messages to team members. At the UAB School of Nursing, faculty created humorous badges based on nursing content, such as a urinal for the first badge with the tag line “Urine the game!” Another badge proclaimed that playing Kaizen was “infectious like poor hand hygiene” (Roche, Wingo, & Willig, 2017). How did Kaizen team competition affect students' motivation to play? What were students' perceptions of their engagement with course material after playing Kaizen? This study was rooted in constructivism or the belief that humans understand meaning through the lens of their own personal experiences, combined with interaction with others (Creswell & Plano Clark, 2011). Gamification in educational settings can foster constructivist pedagogical goals such as encouraging students to take ownership of their learning and to enhance social interaction in learning communities (Pivec, Dziabenko, & Schinnerl, 2003). Students who participated in playing Kaizen did so voluntarily. This study sought to understand how their playing might have provided a “stimulus for learning” and created “social negotiation” through competition, both of which are fundamental constructivist principles (Kirkley & Kirkley, 2005, p. 44). The game also allowed students alternative ways of learning while providing a structure that allowed them to engage with course material and interact with their peers for intrinsic learning (Lainema & Makkonen, 2003). Researchers also undertook the study with an understanding of the principles of adult learning, which posits that students want to take control of their own learning (Merriam, 2001), and a desire to understand how playing Kaizen might appeal to nursing students. Previous qualitative research on Kaizen (Nevin et al., 2014) revealed that medical residents valued the immediate feedback from the game and enjoyed the flexibility of the learning experience. Other research on Kaizen indicated that undergraduate nursing students' “player style” (calculated in terms of log-in clusters/utilization) was associated with their final examination score in the course, as students who played steadily throughout the semester scored higher on their final examination than those who played sporadically (Roche et al., 2018). The encouraging implications for learning from this study further emphasized the need to understand how nursing students engaged with course material when using Kaizen. A qualitative case study design was chosen for this research to allow researchers to better understand student perspectives. Researchers use case study designs to develop an in-depth understanding of a bounded system, using multiple sources of qualitative data to develop a thorough and specific analysis with thick, rich description (Yin, 2014). The bounded system in this study was a group of first-semester nursing students who had played Kaizen. The researchers sought to understand students' specific perceptions of motivations to play and engagement with course content by using qualitative methods such as focus groups, observations, and documents. The study setting was a school of nursing at a public university in the southeastern United States. The university's Institutional Review Board approved the study. During the fall 2015 semester, 133 first-semester undergraduate nursing students enrolled in a fundamental nursing skills course were assigned to teams of eight to play Kaizen. Participation was voluntary, and 94 students in the course logged on and tried to answer at least one question during the semester. Sixty-one percent of the players finished the game, either answering questions consistently over time or in “bursts” throughout the semester. An exclusive “fun-with-faculty party” was the reward for the winning team. One to six Kaizen questions were released weekly, and 71% of the enrolled students answered at least one question. Questions were written in NCLEX-RN® style and were based on the content that had been taught the previous week (Table 1). No questions were identified as more difficult than others, and all players received the same questions at the same time. Students could answer questions at any time during the semester, but they could not change an answer choice once it was submitted. Faculty predetermined when questions would be released, and students did not receive any additional “bonus” questions based on their performance. During the spring 2016 semester, researchers who had not taught the students used convenience sampling to recruit participants. These faculty visited classes and announced that they needed students to give feedback on the game. The faculty distributed flyers inviting students who had played the Kaizen game to participate in focus groups. The goal was to recruit 16 participants. Nine students initially volunteered to participate; the researchers then used snowball sampling, asking students to encourage others to participate. A total of 13 students volunteered to participate in two separate focus groups. As an incentive, participants received a catered dinner and $10 in cash after the focus group concluded. Stake (2010) noted that triangulation of data is important to help researchers recognize the complexity of situations. This study used triangulation of data by including focus groups, observations of students, documents showing leaderboards and participation throughout the semester, and “status of competition” e-mails sent by the game manager to encourage students to play. Students in the focus groups received a catered meal while researchers explained the study in more detail and obtained students' written consent to participate. Students then were randomly assigned to one focus group with six participants and one focus group with seven participants. 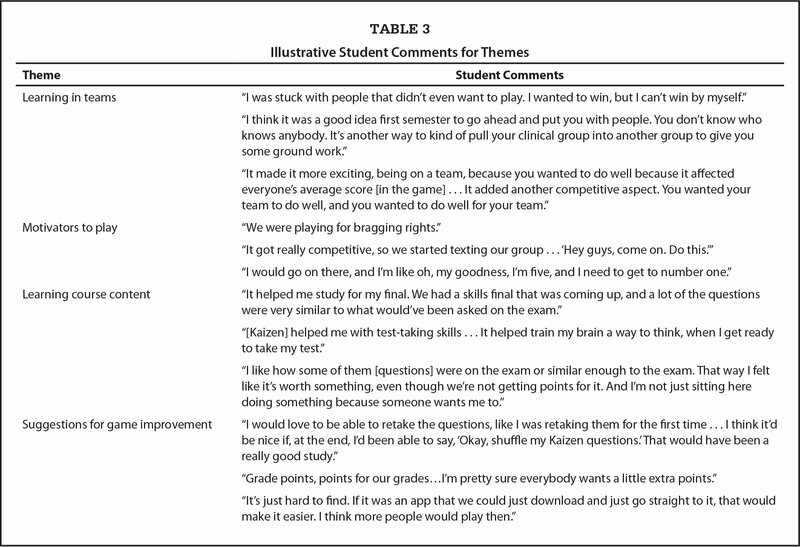 Groups then moved to private rooms for focus group discussions led by two researchers; the discussions were based on a semistructured list of questions (Table 2) with probes that addressed students' perceptions of: 1) team competition in Kaizen, 2) factors that motivated them to play, 3) their engagement with course material, and 4) overall reflections about their playing experience. One researcher led each group, and a second researcher took detailed notes about students' reactions and body language. Researchers were careful to incorporate member checking (Lincoln & Guba, 1985) throughout the focus group discussions by using a reflective listening strategy, repeating various answers or concepts back to students, and asking them to verify their accuracy. Focus group discussions were audio recorded using iPad® tablets. Afterward, researchers conducted a debriefing to compare their observations of each group. They recorded the debriefing on tablets to capture immediate observations and ensure credibility of results. Recordings of the focus group sessions and the researchers' debriefing were sent to a professional service for transcribing; researchers verified transcriptions against recordings to clean the transcripts and to ensure accuracy. Transcripts were uploaded into QSR NVivo Pro 11© software for data analysis. Two researchers, one who had participated in a focus group and one who had not, independently coded each document to determine emerging themes and patterns (Stake, 2010). After reaching data saturation, these researchers met to compare codes and themes. For verification, they then sent an outline of major themes with representative quotes to the three researchers who had been a part of the focus groups. One researcher was the game manager who sent the “status of competition” e-mails and wrote many of the questions for the game. This researcher reviewed the transcripts and checked them against documents to verify that students' recollections of e-mails, types of questions, and leaderboards were accurate. Student comments illustrating each theme are reported in Table 3. Students had mixed responses about their experiences playing Kaizen as teams. A few students described their team members as “apathetic” and “lazy.” Some were disappointed that their teammates were not as driven to win as they were. Others explained that they had formed their own study groups and would have preferred to play Kaizen with those group members. On the other hand, some students recognized that playing in teams was a good way to bond, especially for first-semester students. One participant noted that students were able to apply knowledge learned in Kaizen as part of their clinical group experiences. Another student strongly expressed that being on a team was exciting because it inspired her to do well not only for herself but also for her team members. In the debriefing, one of the researchers noted that she observed many students nodding assent at this idea that team play made the game more fun and more inspiring. Students noted various factors that motivated them to play Kaizen, including peer pressure, instructor “status of competition” e-mails, and a “risk-free” way to study, as well as game elements such as badges, leaderboards, and the ability to remain anonymous by using aliases. Some expressed that they enjoyed having a “fun” outlet for studying, and many students claimed that they particularly appreciated having study questions during examination time. However, in both focus groups, students highlighted two aspects of Kaizen that motivated them: competition and personal challenge. Competition. Many students discussed intense competition that made them want to win the game. They texted team members, encouraging each other to answer questions and move up the leaderboard. One student told a story of sitting across a table from students in another team and “dueling” with each other. A few students related that they texted team members as the game was almost over, rallying everyone to try to beat the team that was winning. Only one student mentioned that the official incentive for winning (a party with team members and faculty) was the motivator. As the researchers noted in the debriefing, it was clear that students simply wanted “bragging rights” for winning the game. Kaizen questions were aligned with course content and released after the delivery of each learning module. Students were overwhelmingly positive in describing how Kaizen helped them learn course content. Many spoke of using Kaizen to study for tests, especially for the final examination. Some noted that a few questions from Kaizen had shown up on class quizzes, and they recognized that instructors intentionally wrote Kaizen questions to help them study. In fact, many students called the Kaizen questions “relevant,” not only in terms of studying for tests, but also for applying in clinical practice. Several students claimed that rationales were particularly helpful with learning course content. A few suggested that Kaizen also helped them learn test-taking skills. Students clearly valued the game, not only for fun competition, but also as a tool for enhanced learning. Researchers also wanted feedback from students that would help improve the game for subsequent undergraduate classes. Students offered various suggestions to improve how the game is offered to students. Students wanted to choose their own teams, and they would have liked more questions (up to a question a day) so that they could review more material. They also suggested that the questions be “reset” for final examination review, so that students could not see their original answers and could better test their knowledge retention. Students enjoyed being awarded badges for a variety of accomplishments and suggested that developers offer more to keep the game interesting. A few students thought instructors should give points in the gradebook as incentives for participation and winning. One student suggested a competition with other schools would be fun. However, the main suggestion students made was that they wanted a mobile application to access the game. Even though students could access Kaizen through a link on any device, they found this to be inconvenient and difficult. All of the students who participated in the focus groups were Millennials (born between 1982 and 2001), and they were used to simply clicking an icon on their smartphones to access software. They believed an app would ensure not only that more people would play, but also that it would offer more features to enhance the game. Game platforms can engage students in innovative, challenging, and enjoyable ways. Yet educators should use student feedback to improve game delivery and ensure impactful student engagement. Previous literature has noted that nurse educators have begun to offer more course content in digital format (Day-Black & Merrill, 2015; Kirkley & Kirkley, 2005), yet many of the games used in nursing have related to simulation or were created using third-party materials (Kirkley & Kirkley, 2005). In addition, as Digital Natives replace Millennial students, it is important for educators to become well-versed in digital learning technologies and develop tools that are easily accessible (Roberts, Newman, & Schwartzstein, 2012). Faculty who used Kaizen desired to create a discipline-specific, customized game for nursing students using software developed at their university. Yet this study showed that even when educators offered Kaizen online, students preferred to access it through a mobile application on smartphones. This finding led the researchers to obtain grant funding for a Kaizen mobile application that is currently under development. The findings were consistent with constructivist and adult learning principles (Kirkley & Kirkley, 2005; Merriam, 2001), in that students wanted more control and tended to describe the game in terms of how it enhanced their learning. They wished for game element features that were customizable, such as choosing their own teams and resetting questions for test review purposes. They also were motivated to play the game for intrinsic rewards such as personal challenges and educational enhancement. As faculty continue to develop digital tools for learning, they may choose to work with instructional designers and software developers who can help them include game features that will ensure more flexibility and control for the users. A significant finding from this study was that students were overwhelmingly positive about using a gamified platform for its educational rewards. In fact, they expressed a need for more questions and additional study methods within the game. They perceived that playing the game increased their knowledge retention, and they believed that it helped improve test-taking skills. Current gamification literature has shown that students may benefit more from gaming than from lectures (Skiba, 2008), but linking student outcomes directly to any one learning strategy can be difficult, especially in clinical courses that include a variety of experiential learning experiences. Even so, the students' positive statements about using Kaizen to enhance their learning, combined with previous research showing learning retention gains (Nevin et al., 2014) and associating consistent player style with higher scores (Roche et al., 2018), suggest that game features of Kaizen were effective in meeting learner needs. The limitations of this study include the engagement of only one cohort of students, many of whom were the same age. Most of the students were driven to succeed, as evidenced by their high achievements required to gain acceptance to nursing school. Even with these limitations, the findings of this study provide context for further research and also illustrate the potential gains of further integrating gamification in formal education settings to enhance students' knowledge, while making learning fun and more engaging. Creswell, J.W. & Plano Clark, V.L. (2011). Designing and conducting mixed methods research (2nd ed.). Thousand Oaks, CA: Sage. Day-Black, C. & Merrill, E.B. (2015). Using mobile devices in nursing education. The ABNF Journal, 26, 78–84. Lincoln, Y.S. & Guba, E.G. (1985). Naturalistic inquiry. Thousand Oaks, CA: Sage. Pivec, M., Dziabenko, O. & Schinnerl, I. (2003). Aspects of game-based learning. Graz, Austria: Third International Conference on Knowledge Management. Skiba, D.J. (2008). Nursing education 2.0: Games as pedagogical platforms. Nursing Education Perspectives, 29, 174–175. Stake, R.E. (2010). Qualitative research: Studying how things work. New York, NY: Guilford Press. Yin, R.K. (2014). Case study research: Design and methods (5th ed.). Thousand Oaks, CA: Sage. Question: What is the recommended length of time to rub the hands together while washing with soap and water? A. 5 to 10 seconds. B. With soap and water: wet your hands with warm water. Use liquid soap if possible. Apply a nickel- or quarter-sized amount of soap to the hands, and rub hands together to form lather. Continue rubbing hands for at least 15 seconds (sing “Happy Birthday” song twice). Dry with paper towels. Research question 1: How does team competition affect motivation to play? Interview questions: 1. How would you describe your Kaizen team? Would you have changed your team in any way? a. Is there anything that might have motivated you to play more as a team? What could you have done to motivate others to play? How did your team communicate? How would your participation have changed if you had been playing only as an individual? How did your individual score affect your motivation to play? Were there any elements of the game (badges, leaderboards, etc.) that motivated you to play individually? What were factors that discouraged your participation? Research question 2: What are nursing students' perceptions of their engagement with course material after playing Kaizen? Interview questions: 1. How did Kaizen meet your learning needs during the semester? Upon reflection, how did Kaizen help you learn course material? What was your approach to answering questions? a. How did you choose your answer? How long did it generally take you to choose an answer? How motivated were you by learning rationales for correct answers? How motivated were you by receiving points in your course grade for answering questions? Describe your level of anxiety when answering questions. a. How was your level of anxiety affected by playing in a team? How might your level of anxiety been different if you played only as an individual? How well do you think Kaizen helped you retain and apply knowledge over time (e.g., previous courses, from week to week, etc.)? Dr. Wingo is Assistant Professor and Director of Instructional Innovation, Dr. Roche is Assistant Professor, Dr. Baker is Associate Professor, Mr. Jennings is Instructional Design Specialist, Dr. Pair is Faculty Instructor, Dr. D'Ann Somerall is Adjunct Assistant Professor, Dr. William Somerall is Assistant Professor, and Dr. White is Assistant Professor, The University of Alabama at Birmingham, School of Nursing; Dr. Willig is Associate Professor, Department of Medicine, Division of Infectious Disease, The University of Alabama at Birmingham, School of Medicine, Birmingham; and Dr. Dunn is Associate Professor, Jacksonville State University, Jacksonville, Alabama. This study was funded by a grant from the Center for Teaching and Learning at the University of Alabama at Birmingham. The original development of the Kaizen game in 2012 was funded in part by the National Center for Advancing Translational Sciences of the National Institutes of Health under award number UL1TR001417. The content is solely the responsibility of the authors and does not necessarily represent the official views of the National Institutes of Health. The authors thank Aimee Holland, DNP, CRNP, WHNP-BC, NP-C, RD, and Donald Dempsey, MS, for their contributions to the data collection. Address correspondence to Nancy P. Wingo, PhD, Assistant Professor, Director of Instructional Innovation, The University of Alabama at Birmingham, School of Nursing, 1720 2nd Avenue South, NB 1013A, Birmingham, AL 35294-1210; e-mail: nancy10@uab.edu.